New shortcut based text input. 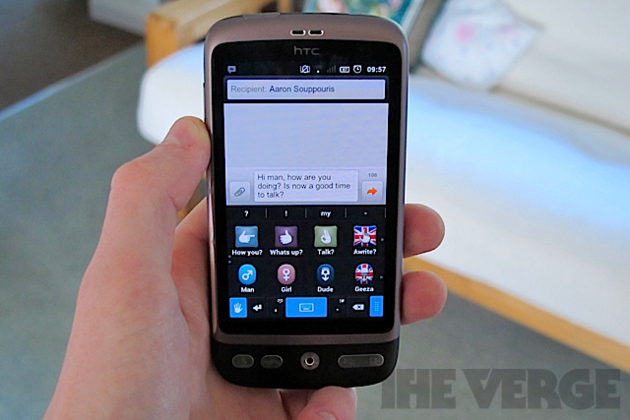 A new alternative Android keyboard has yet another way of thinking about the way you type. Named Siine, it offers three different ways of entering text. Alongside the regular QWERTY keyboard, there are also a number of quick shortcut menus for times, dates, and regularly used words and expressions. Each of these is context-aware and so adjusts to help you form phrases by hiding words once you've used them already. It's designed with Android 4.0 in mind — the app fits in well with the Holo theme, even down to the Market-like Siine gallery. There's also a "stress" mode — if you can't speak to someone and need to generate a reply at speed, Siine has a menu with words and phrases like "sorry" and "can't talk now."